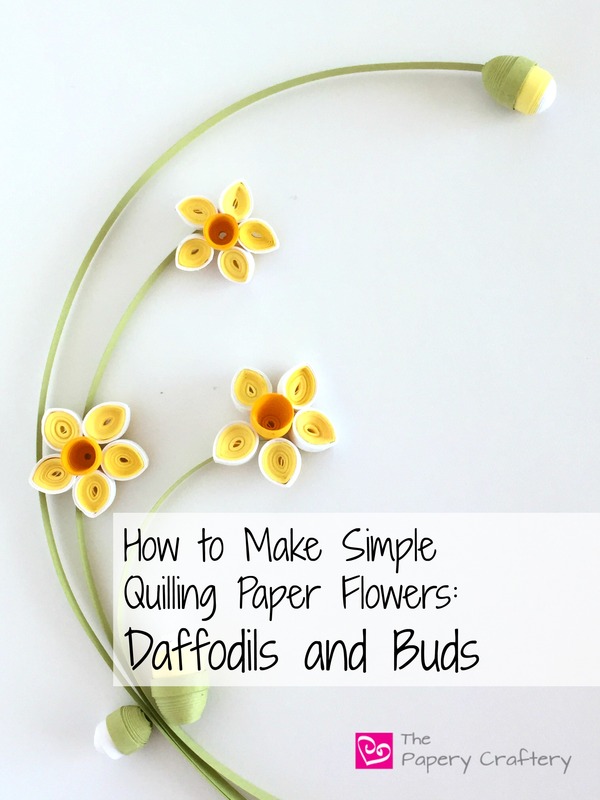 When I decided I wanted to make a new series of quilling tutorials about simple spring flowers, it was only fitting that I would start with the Daffodil. Daffodils are the flower that my husband surprised me with on our very first date. I’m pretty sure he plucked them from his parents’ yard, but it’s been a sweet symbol for us ever since. We also planted some in in the front garden of the house that we have lived in since we got married. Right now that they are in bloom, my Moose has been calling them dandelions. He’s been learning about flowers it’s spring flowers at preschool and a little confused about the fact that there are more than one type of yellow flower, but that’s a story for another time. Flowers and leaves are one of the most popular subjects for quilling paper art, and the methods are endless. But, the daffodil just screams to be created using 3-dimensional quilling. The 3-D quilling technique just involves rolling tight coils, then pushing the center of the coil out with a rounded object, until a dome or cone is made. Because of the unique cup-shape of a daffodil’s center, petals, and buds, I used 3-D quilling for both parts of this tutorial. Only basic quilling supplies are needed for this flower tutorial. A little glue, a needle tool and a small brush, pale green, two shades of yellow and white 1/8″ width quilling paper. To start, I rolled 10″ of deep yellow quilling paper into a tight coil, and glued the end. Once the glue has dried, I used the round end of a pin to push the center out until I see the cone-like shape that I want. To keep the shape secure, apply a small amount of glue all around the inside of the cone and brush to spread the glue. When it is dry, the shape will hold. Voila! Next, I tackled the petals of the daffodil. I chose to roll the petals with 2 colors, for some extra visual interest. For each petal, I rolled a tight coil of 10″ pale yellow and glued the end. While the coil is still on my needle tool, I added a 4″ strip of white to the coil and rolled that as well. The result is a closed, tight coil of white surrounding the pale yellow. Repeat the same steps for all 5 petals. To get the proper shape, simply squeeze one end of the coil into a point. This requires a little finger strength, but you can do it! Use the rounded pin again to push out gently for a domed petal. Glue the petal in the same way as the daffodil center to keep the shape. When all the petals and centers were rolled and dried, I glued them together for the flowers. These are pretty small flowers, but the same techniques can be used to quill larger flowers by using longer strips of paper. For the flower buds, I made tight coils in a method really similar to the daffodil petals. This time, I rolled 10″ of white paper first, then added 4″ of pale yellow to the coil. To make the domed shape, push the center out with something almost the same diameter as the coil. I used the end of a quilling tool, but a pen cap or chopstick will do nicely. Glue, brush and let dry. To create the other side of the flower bud, I rolled 16″ of pale green quilling paper into a tight coil, push into a dome, glue and dry. I attached the two halves of each flower bud, by adding a thin line of glue to the inside of the green dome, and placing the white and yellow part on the end. That’s it! Daffodils have long thin stems and leaves, so plain, straight strips work nicely. Enjoy quilling these simple flowers! I’m planning a few more posts for this series in the next few weeks, (including these tutorials for quilling simple plumeria and lilacs and lily of the valley!) so stop back soon! In the meantime, I’d love to hear how your daffodils and flower buds turned out. Leave a comment below and tell me all about it! Good morning, Barbara! Thanks so much for following. Cutting your own strips can be pretty time consuming, too. I’m sure as soon as your strips come, you’ll be quilling up a storm! I am a beginning quiller. You do awesome work. Thank you so much for the detailed techniques for beginners. This has been so much fun. I have been making birthday cards for my family. Do you know how I could ship them so they don’t get squished? Thank you in advance. Hi there, Pamela! I’m so glad you’ve found quilling. I don’t usually make cards, but when I ship my quilling, I like to sandwich it between 2 pieces of thin cardboard. Then I put all that into a sealable cellophane bag and dress it up with a little patterned washi tape. I also ship in bubble envelopes. You can also try making your own box envelopes like the ones made on this site by Bird’s Cards. There are quite a few other tutorials out there on these types of envelopes if you want to search for others too. I’m so glad you’ve found a use for these. They’re one of my favorite flowers!